A few days ago Gigabyte announced a full range of AMD FM2+ motherboards that support the unannounced Kaveri CPU using an equally unannounced A88X chipset. Gigabyte doesn’t give any specs away for Kaveri but it isn’t hard to read between the lines. There are seven boards just announced, the G1.Sniper A88X , F2A88X-UP4 , F2A88X-D3H, F2A88X-HD3 , F2A88XM-D3H , F2A85XM-DS2 , and F2A88XN-WIFI, quite the complete range. 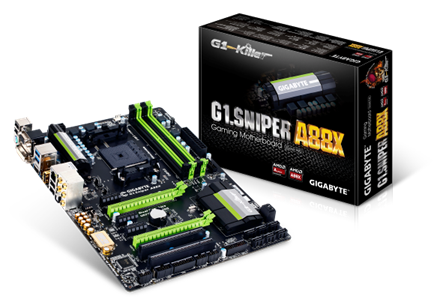 Of the boards there are two that stand out, the G1.Sniper A88X and the F2A88X-UP4 both of which are from the top-tier ranges of the Gigabyte lineup. Until now there were few AMD boards at this level from Gigabyte or any other top-tier maker, a reflection of the confidence that the industry had in AMD after the Llano debacle. Trinity and Richland were proof points that they could deliver and the support for Kaveri looks to be a reflection of this confidence. Seven boards are not a tentative step, nor is a G1.Sniper gaming rig. Do read things into this. The G1.Sniper is the best of the bunch and it carries the most unique board feature we saw at Computex, swappable op-amps. When playing with the Intel based G1.Sniper 5 the benefits of the amps were, pardon the pun, quite clear. Different amps clearly changed the sound quality and certain amps were definitely better suited for some music types than others. With the A88X version Gigabyte added two useful features not found on the first board. Since these motherboards have a real amp on board, why not use it to amplify instead of just changing tone quality? There are now two switches that turn on progressively higher gain audio signals, 2.5x and 6x the default power. If you have high quality headphones that have the right impedance characteristics, this is the feature you have been waiting for. Then again if you care enough about audio to understand why you want a swappable op-amp, high quality headphones are almost a given. To supply external speakers and audio equipment with a good signal, Gigabyte has again isolated the audio circuitry, audio processors, and everything else audio on separate power plane and used Nichicon MUSE ES audio oriented caps there. The new parts of this is for USB based DACs (Authors note: Blech!) Gigabyte has also electrically isolated a USB port and gold plated it. They call this USB DAC-UP and claim it has 2x less noise than the normal USB ports. While it isn’t strictly necessary for a digital signal, any USB-based sound solution needs all the help it can get so we won’t complain. From here the F2A88X-UP4 looks a bit plain but it is possibly the more important product of the two. As we mentioned above having a range topping board AMD CPU board from a major manufacturer was a pretty rare event. The -UP4 line isn’t quite the top of the Gigabyte line but for a CPU in the market segment that Kaveri is in this board is a real statement. Until AMD comes out with a higher end gaming CPU, this level of board is about the most an enthusiast can use and for once it will be there before the chip launches. The lower end boards are where the volume is, the two mentioned above are a very nice halo for enthusiasts which was notably absent for AMD products. That brings us to the part about reading between the lines. AMD has mentioned Kaveri here and there but nothing definitive about its capabilities, launch date, or much else. Most of the details have been leaked already but now we have a backhanded confirmation from a third-party. First off what chipset is Gigabyte using for these boards? Careful reading of the press release doesn’t actually mention that fact but if you know how to parse the Gigabyte naming scheme you know it is the A88X, and to the best of our knowledge AMD has not actually announced that part. What does it add? Support for the FM2+ socket that Kaveri needs but also support for the FM2 sans + FM2 that Trinity and Richland use. As was suspected, the plus brings support for new power modes, voltages, and likely added power planes. It also adds support for PCIe3, a notable hole in the AMD lineup of late but again not a big shock. Also on the list are DX11.1, not DX11.2 support and more interestingly native 4K resolution support. Why is that important? DP1.2 and HDMI1.4 don’t support that with anything resembling ease, sanity, or acceptable frame rates. The native 4K support over a single cable strongly suggests a rev to both HDMI and DP to an updated version.